St. Paul’s Sibley Plaza shopping center will be torn down after nearly 60 years to make way for a Fresh Thyme Farmers Markets grocery store, a fitness center and 120 apartments, according to plans released by the property owner. Sibley Plaza owner Paster Enterprises is partnering with Bader Development on the $50 million mixed-use project at the West Seventh Street property, which Paster has been contemplating for months. It will take a year to plan the project and obtain entitlements from the city, Paster Vice President of Development Ken Henksaid. Demolition would begin next summer and construction would end in spring 2017. Longtime Sibley Plaza businesses will close, including Cooper’s Supervalu and 7th Street Tavern, which is the originalChampps but had to change its name earlier this year. St. Paul-based Paster is working with existing tenants who might come back. He said Paster is close to finalizing a 28,600-square-foot lease with Chicago-based Fresh Thyme Farmers Market, the produce-focused grocer that is planning to open its first Minnesota store in Bloomington next year. “We are very excited to have them in the mix,” Henk said. Paster is also working with an unidentified national fitness chain for another 37,000 square feet and with CVS for a 13,600-square-foot store, although the pharmacy space could instead be split up for a restaurant and coffee shop. 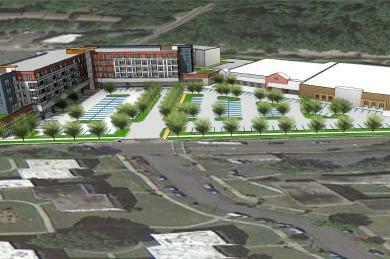 The new development will have 97,600 square feet of retail space, up slightly from the current square footage. The housing component will be market-rate apartments from studios to three-bedrooms, Henk said. The development will include 200 underground parking spaces and 414 surface spots for shoppers. ESG Architects of Minneapolis is the project’s designer.